Q. Can I access Cochrane Reviews? If you are involved with evidence-based practice in health care or related fields, including social work, psychology, and education, then it is likely that you will need to consult systematic reviews as part of your review of the evidence. The Cochrane Reviews are considered to be essential systematic reviews for human health care and health policy. “They may either investigate the effects of interventions for prevention, treatment, and rehabilitation, or alternatively, may assess the accuracy of a diagnostic test for a given condition in a specific patient group and setting” (http://community.cochrane.org/editorial-and-publishing-policy-resource/cochrane-database-systematic-reviews-cdsr). At this point in time, the Cochrane Library contains more than 5,000 systematic reviews. Although the University Libraries does not subscribe to the Cochrane Library full text, you can still browse free systematic review summaries, which may be filtered by health topics (e.g., child health; developmental, psychosocial and learning problems; public health), or searched by various fields (e.g., MESH terms, keywords). Another good way to identify relevant Cochrane Reviews is to search our subscription database Medline, or the freely-available version, PubMed (be sure to use the database link from the library's homepage), combining topical keywords and the keyword Cochrane and limiting your results to Reviews. Or you can use the Advanced Search for topical keywords or MESH terms and then also type The Cochrane Database of Systematic Reviews in the Journal field (see below). Once you have identified relevant Cochrane Reviews, you will need to request a scanned copy of the review/s through Interlibrary Loan. 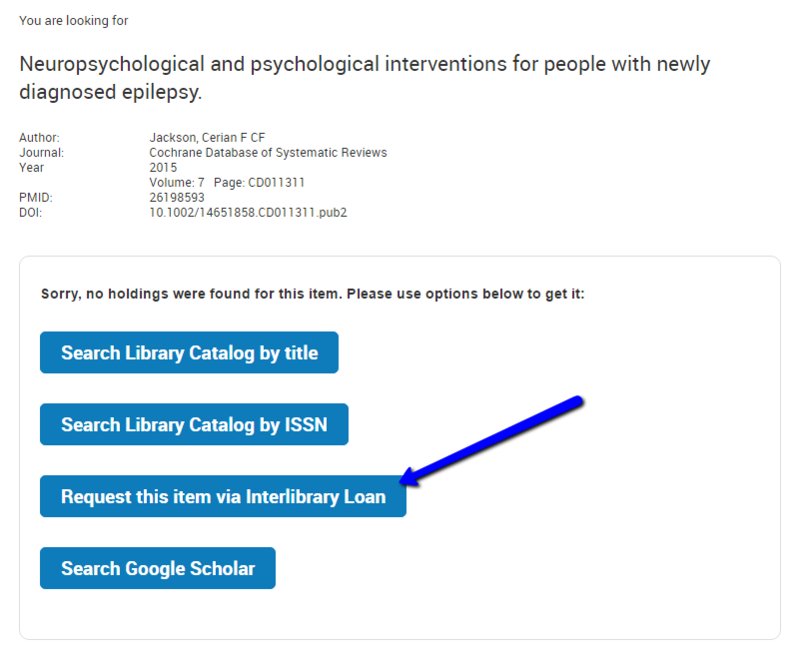 If you are directed through ArticleLinker, you will select the Document Delivery request link which will generate an interlibrary loan request. Typically it takes about two to three days for the review to be scanned and you will be sent an email to access your copy.